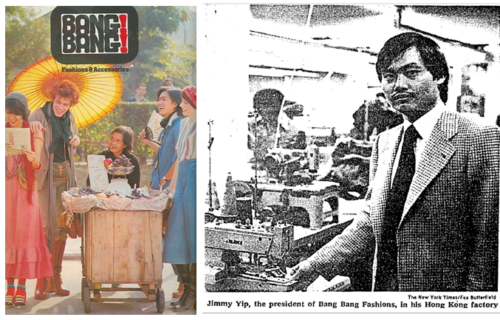 Left: Print ad of Bang Bang; Jimmy Yip at the Bang Bang factory as featured in the 1977 New York Times article. In the mid-late 1970s, Hong Kong became the largest garment exporter in the world and one of the brightest stars in the HK garment industry at the time was Bang Bang Fashions. Backed by a large manufacturing operations, Bang Bang jeans and sportswear were popular with young people and the brand extended to restaurants, TV show, featured films, record label, and even instant noodles. The group also marketed jeans under the Faded Glory brand in the US, which did US$55 mil (US$222 mil in 2017 dollars) of sales at its peak in 1976. Its rapid rise and fall paralleled that of the Disco fever from that era and today the original Bang Bang brand no longer exists although a vintage clothing store by the name of Bang! Bang! 70s operates out of Aberdeen Street capitalizing on its 70s fashion icon status while the Faded Glory brand has had a second life as a house brand of the American retail giant Walmart since 1993. Bang Bang was the creation of Jimmy Yip Chi-ming (葉志銘, 1943-), the serial entrepreneur covered earlier in the article about HK wig makers where he made his first fortune with Ming Tat (HK) Industrial (銘達實業). When the wig boom turned to bust in the early 1970s, Yip very quickly reconfigured his operation to manufacture faded blue jeans, which had just become the craze in Europe. With his brother Yip Chi-kwong (葉志光), he formed Kapok Garments (紅棉製衣) in 1971 to export fashion and jeans to the US and Europe. Instead of simply acting as a subcontractor, Yip partnered with three Americans – the 25 years old Michael Shane whom he knew from the wig business, his brother Jimmy Shane and another business partner Billy Kolber – and together they formed Appendagez Inc in the US which created their own jeans brand Faded Glory in 1972. Through smart marketing and attention to retailers, the Faded Glory business took off in the US and by 1974, Kapok as Faded Glory’s main supplier had over 500 employees, 46000 sq ft of factory space and annual output of over 4 million pieces of clothings. The same year, Yip created the Bang Bang brand in Hong Kong. With heavy marketing (which included lots of fashion shows and publicity tours) and trendy designs, Bang Bang quickly became a popular brand in Hong Kong just as Faded Glory became a huge success in the US. Sales of the group jumped from less than $10 million in 1973 to over $100 million in 1976, landing Yip in the New York Times. Aside from the Yip brothers, executives at Bang Bang included Yiu Po-chung (姚寶中), Hui Chun-yau (許春祐), Yuen Man (袁文) and Kitty Koo (辜潔慧), a former fashion model was placed in charge of PR. 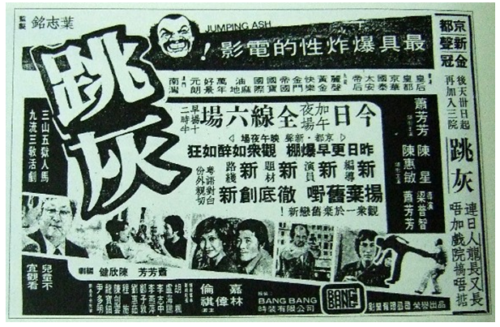 To further enhance the brand, Bang Bang partnered up with TVB in the late 1970s to produce a variety program in its Jade Chinese channel targeting the young demographics called “BANG BANG 咁嘅聲”. 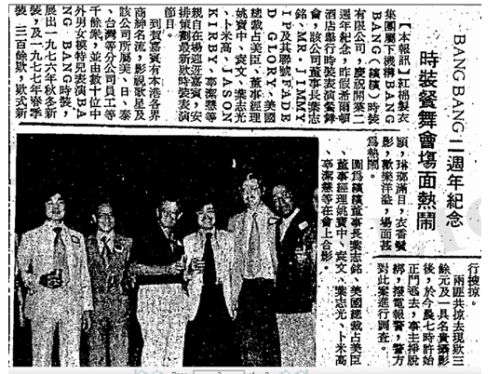 The hosts of the show include many young stars at the time including George Lam, Dodo Cheng, Alan Tam and Louis Castro. Yip also formed Bang Bang Films in 1976 which produced six films in four years, the most famous of which being Jumping Ash, a groundbreaking crime movie directed by Po-Chih Leong and Josephine Siao (written by her and former police detective Philip Chan) regarded as one of the first movies in the New Wave movement in HK cinema with two theme songs that are popular to this day. Left: Vintage Faded Glory jeans by Appendagez from the 1970s; Right: Closing credit of the Bang Bang variety show with George Lam. The success of the Bang Bang group unfortunately did not last. Sales of Faded Glory in the US peaked in 1976, plateaued for the next few years and then plummeted. Michael Shane sold his interest in Appendagez in 1979 for US$1.3 million and later embroiled in a legal dispute with his former partners (he also proceeded to launch the Leading Edge brand of PC clones). Faded Glory folded operations a few years later and the brand was later purchased by the Dayan brothers of Bonjour Jeans before being resurrected as a private brand by Walmart in the 1990s. As Bang Bang experienced financial difficulties, Yip sold the firm to Deacon Chiu and the Carrian Group in the early 1980s and was eventually closed down. After Bang Bang, Jimmy Yip launched several more trendsetting ventures, making and losing several more fortunes along the way. In 1981, he launched a chain of popular seafood restaurants under the name of North Sea Fishing Village (北海漁村) and also developed a beachfront resort/amusement park in Sharp Island (or Kiu Tsui To, 橋咀島) in Sai Kung. The resort was sold to Guangdong Investment in 1987 and was closed down in 1989. In 1987, he founded Fitto Entertainment (飛圖), which put him back on the map for popularizing karaoke in HK in the early 1990s but was ultimately doomed by the ambitious Fantasy Film City studio he was trying to build in the mainland. After a series of setbacks (his son’s death in 1998 and his personal bankruptcy in 2001), Yip gave up on the business world and became a Buddhist monk. This article was first posted on 4th December 2017.